In field conditions plants undergo combinations of stresses like soil compaction combined with soil drought or flooding. In maize there exists an intraspecific variation in responses to environmental stresses, e.g. drought, flooding and soil compaction. In this study seedlings of two maize hybrids (sensitive and resistant to soil compaction) were grown under low, moderate and high soil compaction levels and drought or flooding. Water potential, electrolyte leakage, chlorophyll a content, gas exchange, ABA and antioxidant activity were measured. In seedlings exposed to different soil compaction levels differences between soil, leaf and root water potentials were observed at noon and later in the day. Significant differences between hybrids grown in low and severe soil compactions and exposed to drought or flooding were noticed in membrane injury, leaf water potential, chlorophyll a content and gas exchange parameters. Statistically significant differences between hybrids were observed in ABA content in the stem under severe and in the root under low soil compaction and exposed to drought and flooding, and in antioxidant activity in leaf under severe soil compaction and under low soil compaction with drought or flooding stresses. Further studies on physiological responses of genotypes contrasting in tolerance to different stresses would help us explore stress tolerance mechanisms. In field conditions plants undergo combinations of stresses like soil compaction combined with flooding or drought. Elevated level of soil compaction can be a result of many natural processes and excessive use of heavy machinery in cultivation (Jones et al. 1989; McKersie and Lesheim 1994; Masle 2002; Ashraf 2010; Grzesiak 2016). Important factors affecting plant development under soil compaction are water status, soil aeration and resistance. Resistance below 3 MPa and above 10 % (v/v) air-filled porosity are thought to be necessary for optimal growth (Mittler 2006). In the conditions of high compaction plant growth is restricted and plants become more vulnerable to unfavourable soil water content resulting from too little or too much rain. (Ripley et al. 2007; Chen and Weil 2010; Grzesiak 2016). The main result of high compaction stress is a decrease in the size of roots and the above-ground part of the plant. Characteristic symptoms in the root system structure in compacted soil are a decrease in root size (including changes in root number, length and thickness), retarded soil penetration, smaller root depth and deformation of root cells and tissues because local environment around the roots is more heterogenous in compacted than in uncompacted soil. Reduced root growth in compacted soil is caused by decreased oxygen availability in wet soil and lower total water content in dry soil, due to greater root–soil contact and higher unsaturated hydraulic conductivity. Similarly, growth in high soil impedance causes changes in above-ground plant parts and a decrease in stem diameter and plant height as well as in leaf number, area, thickness, specific leaf area (SLA), thickness of epidermal cell and cell wall (Clark et al. 2003; Fageria et al. 2006; Grzesiak et al. 2013a). In many studies stress susceptibility indexes (SSI) are applied for estimation and description of plants strategies to alleviate environmental stresses. The tolerance of plant species to stress factors is determined by the plant’s genes and depends on the species, variety and age (Golbashy et al. 2010; Liu et al. 2010; Ashraf 2010; Grzesiak et al. 2013b). Negative water balance in plant tissues is one of the common consequences of environmental stresses to which plants are exposed and as such is a bottleneck of agricultural development. Growth reduction, increase of membrane injury and decrease of stomatal conductance and photosynthesis are the first responses of plants to environmental stresses (Ripley et al. 2007; Saliendra et al. 1996). Exposure of roots to oxygen shortage by flooding induces changes in the intensity of dark respiration and an increase in the use of carbohydrates and in the synthesis of antioxidants (Couee et al. 2006; Crawford 2003; Sun et al. 2015). Plants adapt to oxygen shortage by metabolic processes like maintaining carbohydrate content, avoiding acidification of the cytoplasm and launching a defence antioxidant system (Nayyar and Gupta 2006; Rut et al. 2010; Sairam et al. 2008, 2009). It has also been shown that plants transition to anaerobic respiration to meet the demand for energy, a deficit of which occurs under oxygen deficiency conditions as a result of blocking the Krebs cycle and oxidative phosphorylation (Lipiec et al. 1996). In recent years, many papers have been published on the role of hormones in plant tolerance mechanisms to various stressors. They participate in both the immediate and long-term reactions upon plant exposure to stress factors (Else et al. 2009; Jackson and Ram 2003). Under high soil compaction shoot and leaf growth and functions may be restricted by particular root-to-shoot signals. Information about root growth conditions is transmitted to the shoot by plant hormone ABA, which has been recognized as a major chemical signal agent under different stresses and frequently triggers stomata closure. In compacted soil, root-to-shoot signals are caused by reduced soil water content under drought or by decreased water oxygen content under flooding (Reddy et al. 2004; Yoshioka and Shinozaki 2009). According to Bingham (2001) similar systems of signalling are involved in the adaptation of leaves to soil compaction or drying although they may engage a different set of signal molecules. The aim of this study was to examine the responses of maize hybrids grown in low, moderate and high soil compaction with limited or excess water content in soil. Soil compaction sensitive and resistant hybrids were chosen based on our previous experience (Grzesiak et al. 2013a, b; Grzesiak 2016). Generally, combined exposure to two or more abiotic stresses causes a more harmful effect compared to a single stress. However, there are known examples where the effects of exposure to one factor are alleviated by the other factor. Maize is one of the most important cereals in the world and is cultivated under a wide range of climatic conditions. It is also an interesting research model because of its C4 photosynthesis, Kranz-type bundle sheath structure and of root system structure comprising adventitious and primary root axes. Hybrids investigated in this study are middle-early maturing types and flint (Tina) and dent (Ankora) type kernels. Their choice was based on stress susceptibility index (SSI) according to Grzesiak et al. (2013a). The degree of susceptibility of maize to the combined stresses of soil compaction with drought or flooding is a desirable physiological research target, and discovering the physiological mechanism and exploring strategies conferring cross-tolerance in maize are important agronomic interests. Determination of physiological markers (soil, root and leaf water potential, electrolyte leakage, chlorophyll a content, gas exchange parameters, ABA content and antioxidant activity) may explain how maize manages its growth under environmental multistress (Grzesiak 2016). The experiments used two maize single-cross hybrids (Ankora, Tina) obtained from SEMPOL-Holding Trnava, Slovakia. These hybrids had been used in our previous studies (Grzesiak et al. 2013a, b), on the basis of which Ankora was selected as susceptible to soil compaction stress and Tina as resistant. Plants were grown in an air-conditioned greenhouse. The following day/night conditions were applied: temperature 23/18 °C (±2.5 °C), relative humidity (RH) 70/60 % (±5 %), 14 h photoperiod from 7 am to 9 pm (artificial irradiance, Philips SON-T AGRO, 400 W). Photosynthetically active radiation (PAR) was equal to about 350 µmol m−2 s−1. One pre-germinated grain was planted per pot at the depth of 2 cm. Pots used in the experiments were PVC tubes of 8 cm diameter and 18 cm height, filled with sand as rooting medium and fitted with a window which enabled the sampling of roots. Air-dried sand was sieved with 0.25 cm mesh and mixed with NPK fertilizer: N—28 mg, P—18 mg, K—14 mg per 1 kg. Three compaction treatments were applied—low (L—1.1 g cm−3), medium (M—1.3 g cm−3) and severe (S—1.6 g cm−3). According to Grzesiak et al. (2014b) air-dried sand samples of 100 cm3 compacted to the three impedance values weighed 110.0, 130.0 and 160.0 g. These were placed inside metal cylinders, with a 1-mm hole at the bottom. Afterwards cylinders with sand were placed inside a container filled with water for 30 min. After 8 h, maximal soil water content in samples was 0.47, 0.41 and 0.39 g cm−3, and after 48 h it decreased to 0.25, 0.22 and 0.18 g cm−3, respectively. According to Hillel and van Bavel (1976), the obtained values were assumed 100 % of soil field water capacity (FWC). PVC tubes were weighed every day, and the loss of water through evapotranspiration was refilled to keep the constant mass in each treatment (Grzesiak et al. 2013b, 2014b). For control treatments (L + C, M + C and S + C) soil water content was maintained at 65–70 % FWC from sowing to 28th day. In drought treatments soil water content was kept at 30–35 % FWC, and the pots were not watered for 7 days from 14th to 21st day (L + D, S + D) or for 14 days from the 14th till 28th day (L + D, M + D, S + D). Similarly, for waterlogging soil water content was retained at 100 % FWC from 14th to 21st day (L + W, S + W) or from 14th to 28th day (L + W, M + W, S + W). For waterlogging, PVC tubes were submerged in a container in which the water level was 2 cm above the soil surface. Mechanical impedance was measured with the penetrometer DIK 5520 (Daiki Rika Kogyo Co. Ltd., Japan). where C and T refer to the conductivity of control and treatment solutions, respectively, and subscript 1 and 2 refer to initial and final conductivity, respectively. Nine leaf discs (0.5 cm diameter) were cut from leaves and immersed in test tubes containing 30 cm3 redistilled water. After 24 h initial conductivity measurements were taken. Final conductivity measurements were taken after autoclaving all tubes at 110 °C for 15 min and cooling them to room temperature. Water potential (ψ) was measured using psychrometer HR33T (Wescor Inc., Logan, USA) in “dew point” mode, equipped with sample chamber C-52 SF (Wescor Inc., Logan, USA) and digital multimeter Metex M-3640 D. Samples were placed inside the psychrometer chamber and left to balance temperature and water vapour equilibrium for 30 min before measurements. Measurements were made on the 4th, i.e. most recent fully expanded leaf. Chlorophyll content (SPAD) was measured using SPAD CL 01 m (Hansatech, Norfolk, UK). Gas exchange parameters (P N—net photosynthesis rate; E—transpiration; g S—stomatal conductance) were measured using IRGA analyzer (CIRAS-2, PP System, Amesbury, USA) with Parkinson’s assimilation chamber for narrow leaf and with light attachment. During the measurements an open system was used. The flow rate of ambient air with a constant CO2 concentration (390 µmol mol−1) through the assimilation chamber amounted to 0.5 dm3 min−1. Chamber temperature was kept below 25 °C until the photosynthesis rate stabilized. Photosynthetic capacity at light saturation was reached by exposing leaves to PAR at 800 µmol m−2 s−1. Measurements were made on the 4th leaf from 11 am to 1 pm. Quantification of ABA Plant material was freeze-dried and ground with ball mill MM400 (Retsch, Haan, Germany) in Eppendorf vials to which 1.5 mL of cold distilled water was then added. The vials were heated for 3 min in thermoblock set to 90 °C and then shaken overnight at 4 °C to extract ABA (Quarrie et al., 1988). The next day, the aqueous extracts were centrifuged for 20 min in a refrigerated centrifuge at 18,000×g (MPW-350R, Warsaw, Poland). ABA was measured in the supernatant using indirect enzyme-linked immunosorbent assay (ELISA) according to Walker-Simmons and Abrams (1991). The antibody used was MAC 252 (Babraham Technix, Cambridge, UK). Absorbance was measured by microplate reader Model 680 (Bio-Rad Laboratories, Hercules, CA, USA) at the wavelength of 405 nm. For each treatment, at least six ELISA measurements were performed on three independent samples collected from three different plants. Total antioxidant activity Free radical-scavenging activity in the tissues was measured by DPPH method according to Brand-Williams et al. (1995) with adaptation of the protocol to 96-well microtitre plates and to the measurement of absorbance by microtitre plate reader (Płażek et al. 2011). Absorbance was measured after 30 min at 37 °C using Bio-Rad reader Model 680 (Bio-Rad Laboratories, Hercules, CA, USA) at 515 nm. The results were expressed as μmoles of Trolox equivalents. For each treatment, at least six independent measurements were made on three independent samples collected from three different plants. The experiments were carried out in a completely randomized design. The results presented are mean values ± standard error based on nine (SPAD, ψ L, P N, E, g S), eight (LI), six (ABA, antioxidants) and three (diurnal changes of ψ S, ψ R and ψ L) replications. Data analysis was performed using STATISTICA 10.0 (Stat-Soft Inc., Tulsa, OK, USA) using two-way analysis of variance (ANOVA)—included in the legends of tables and figures for ABA and antioxidants—and Duncan’s multiple range test at p ≤ 0.05. Maize hybrids chosen for the experiments differed in susceptibility to soil compaction stress on the basis of stress susceptibility index (SSI) which was calculated according to Fischer and Maurer (1978). For M and S treatments SSI for Ankora was 1.40 and 1.17 and for Tina 0.61 and 0.69, respectively. After 28 days of seedling growth under low (L + C) or severe (S + C) soil compaction and optimal soil water content the decrease of dry weight was higher in Ankora than in Tina. Moreover, differences of seedlings’ dry matter between L + W or S + W and L + D or S + D were markedly higher for Ankora than for Tina (results not shown). Measurements of ψ S , ψ R and ψ L were taken after 14 days of development under low (L) and severe (S) soil compaction with optimal soil water content (C—about 65 % FWC) and over the next 7 successive days (from 14th to 21st day) for seedlings grown in pots without watering (L + D, S + D) and for seedlings flooded in a container with water (L + W, S + W). Samples of leaf, root and soil were taken from 8 am to 8 pm at 3-h intervals in 3 replications (Figs. 1, 2). During 7 days of seedlings growth under drought (L + D, S + D) or waterlogging (L + W, S + W), the stresses strongly affected diurnal changes of ψ R and ψ L and also ψ S but only in drought stressed plants (Fig. 1). For seedlings subjected to drought the differences in ψ S between hybrids were observed under both L + D and S + D. For sensitive hybrid (Ankora) in L + D and S + D treatments ψ S decreased from −0.22 to −1.60 and from −0.31 to −1.75 MPa, respectively, and in resistant hybrid (Tina) from −0.18 to −1.20 MPa and from −0.21 to −1.51 MPa, respectively. During the successive days of seedlings’ growth without watering, differences between ψ S and ψ R and between ψ S and ψ L were observed and were highest around noon and later in the day (11 am, 2 and 5 pm) and lower in the morning (8 am) and evening (8 pm), particularly in the case of ψ R. Also for L + D and S + D the differences between ψ R and ψ L around noon and later in the day in Ankora were small comparing to Tina (Fig. 1). In both soil compaction treatments and in waterlogging conditions the changes of ψ R and ψ L were lower in comparison with drought conditions (Fig. 2). The reason for the changes in diurnal fluctuations of ψ R and ψ L under drought and waterlogging treatments around noon and in the afternoon is that the high rate of transpiration at midday is not counterbalanced completely by the roots’ water uptake from the soil. In the afternoon the evaporative demand gradually declines because more water enters the plant through the roots than is transpired by the leaves. The tissue again becomes filled with water, and ψ L and ψ R increase. At the end of the night an almost complete balance is achieved between ψ R, ψ L and ψ S. This complete recovery is attained after the 1st, 2nd and 3rd day, but is no longer achieved between 4th and 7th day. Table 1 shows the analysis of variance (ANOVA) of ψ S, ψ R and ψ L in the two maize hybrids grown under L + D, L + W, S + D and S + W treatments. For all factors (h—hybrids, t—treatments, c—soil compaction and d—day) and all interactions between the factors, the variance was statistically significant, with the exception of h × t × c in the leaf water potential. Measurements of LI and SPAD were made in seedlings grown from sowing to 28th day in three soil compaction treatments (L, M, S) and under optimal soil water content (C) and under drought (D) or waterlogging (W) from 14th to 28th day. However, the measurements of ψ L, P N, E and g S were carried out on seedlings grown only in L and S soil compaction and under C, D and W soil water content. The measurements were performed between 11 am and 1 pm. After 28 days of seedling growth in M + D, M + W, S + D and S + W treatments the values of LI in the sensitive hybrid were larger than in the resistant one (Table 2). In M + C and S + C treatments the values of LI in Ankora were 8.1 and 11.1 and in Tina 6.4 and 8.5, respectively. Under drought (35 % FWC) in L + D, M + D and S + D treatments the values of LI in Ankora were 13.1, 18.3 and 29.4 and in Tina 11.3, 13.1 and 21.0, respectively. Under waterlogging stress (L + W, M + W, S + W) leaves were less leaky to solubles with LI values slightly lower than under drought—in Ankora 9.8, 13.0 and 18.5 and in Tina 6.9, 8.8 and 11.9, respectively. For seedlings grown under three soil compaction treatments and subjected to drought (L + D, M + D, S + D) or waterlogging (L + W, M + W, S + W), a decrease of SPAD was observed (Table 2). The decrease of SPAD in M + C and S + C treatments in comparison with L + C was about 25 and 58 %, respectively, in Ankora and 30 and 42 % in Tina. In low and moderate soil compaction (L + D, L + W, M + D and M + W) the differences between hybrids were small and often not statistically significant. Differences in SPAD between Ankora and Tina were observed both in S + D and S + W treatments. In comparison with L + C treatment, the decrease of SPAD in S + D and S + W treatments for Ankora was 30 and 31 %, respectively, and for Tina 23 and 21 %. The obtained results show that for the tolerant hybrid Tina grown under M + C or S + C the decrease of chlorophyll content was smaller in comparison with the sensitive hybrid Ankora. The decrease of ψ L in seedlings of both hybrids grown for 28 days under S + C conditions was small (about 10 %) in comparison with L + C (Table 3). In seedlings of both hybrids subjected to L + D or L + W the decrease of ψ L was similar and at the same time it was about three times greater than in the case of L + C treatments. S + D treatment caused a decrease of ψ L in Ankora by about 25 % and in Tina by about 7 % in comparison with L + D. Waterlogging stress caused a decrease of ψ L in Ankora by about 20 % and in Tina by about 10 % (Table 3). The decrease of P N in seedlings grown under S + C treatment amounted to about 23 % in Ankora and 15 % in Tina but the differences in E and g S between L + C and S + C were very small in both hybrids and amounted to about 29 % in the case of E and 14 % in the case of gS. The decrease of Pn in S + D and S + W treatments in comparison with L + D and L + W treatments was 27 % for Ankora and 22 % for Tina. Significant differences between both hybrids were observed in E and g S. The decrease of E in S + D and S + W treatments in comparison with L + D and L + W treatments was 45 and 50 %, respectively, for Ankora and 32 and 35 % for Tina. Similarly, the decrease of g S in S + D and S + W treatments in comparison with L + D and L + W treatments was 29 and 18 %, respectively, for Ankora and about 40 % in both treatments for Tina. The variance was significant for all variables (h, c, t) but not for the interaction between hybrids and soil compaction variables (h × c). ABA content under control (L + C) conditions ranged from ca. 1.3 (roots) to 2.4 (leaves and stem) nmol g−1 DW (Fig. 3). There were no statistically significant differences between the hybrids investigated. Severe soil compaction or drought as a single stress increased ABA level in the stem and leaves but only in the tolerant hybrid Tina. In the case of drought, this ABA increase in the stem and leaves was combined with its significant decrease in roots. Multistresses affecting roots (S + D and S + W) did not change their ABA level but they substantially increased ABA content in the stem and leaves of the tolerant hybrid Tina and in the leaves of the sensitive hybrid Ankora. The ANOVA of ABA content and all factors investigated (Table 4) shows statistically significant interaction between hybrids and soil compaction (h × c) for ABA content in the stem, which indicates hybrid-specific impact of soil compaction on stem ABA content. Similar interaction is observed between soil compaction and water availability. Total antioxidant activity under control (L + C) conditions was manifold higher in leaves than in stem or root tissue and it differed significantly between hybrids only in the stem (Fig. 4). Under severe soil compaction it increased significantly in both hybrids but only in stem tissue. Multistress S + D substantially decreased antioxidant activity in the roots of both hybrids. The ANOVA of total antioxidant activity and all factors investigated (Table 5) shows hybrid-specific interaction with soil compaction and water availability in the case of antioxidant activity in the stem and leaf (h × c × t). Non-enzymatic antioxidants play an important role in antioxidant defence system and are involved in redox signalling in plants under various environmental stresses. Any substantial changes of their activity can be interpreted as an oxidative stress. Significant decrease of their activity in roots under water shortage conditions (L + D, S + D) in comparison to control conditions (L + C) confirms that their biosynthesis rate is lower than their usage for scavenging free radicals. On the other hand, severe soil compaction (S + C) significantly increased their activity in the stem, whereas combined stress (L + D and S + W only in Tina) alleviated this effect (Fig. 4). Statistically significant linear correlation coefficients (r) between ABA content and antioxidant activity were found only in root and stem for resistant hybrid Tina. For this hybrid a statistically significant correlation was also found between ABA content and antioxidant activity in root and ψ, P N, E and g S. For both hybrids a statistically significant correlation was found between ψ and P N, E and g S, P N and E and g S, and E and g S. For soil compaction sensitive hybrid Ankora significant correlations were also found between LI and SPAD, ψ, P N, E and g S but for resistant hybrid Tina only between SPAD and E and gs (Table 6). Interaction between physiological and biochemical markers According to Mittler (2006) the interactions between physiological and biochemical markers will be determined by comparison of separate effects of drought or waterlogging stresses (D, W) with their combined effects with soil compaction stress (L, S). This interaction may be described as (1) no interaction when differences are lower than (±10 %), (2) potentially negative interaction, in a situation where the combined effect of both stressors is higher (+10 %) than the effects of only one of them, and (3) potentially positive interaction in a situation where the combined effect of the two stressors is lower (10 %) than the effects of only one of them. The physiological markers used in this study (membrane injury, water potential, gas exchange parameters, chlorophyll content) indicated only potentially negative interaction between soil compaction and limited or excessive water content in soil. Potentially negative interactions in Ankora were always higher than in Tina as well as in seedlings grown under low or severe soil compaction. In the case of biochemical markers (ABA content and antioxidant activity) the nature of the interaction between L or S soil compaction and soil water content (D, W) was not clear (Table 7). In Ankora potentially negative interactions for ABA content were observed in six cases and for antioxidant activity in five cases and in Tina in three and four cases, respectively. In other cases, both in Ankora and Tina the interactions were potentially positive or no interactions were found. Based on the relations of changes in dry matter, the evaluation of stress susceptibility indexes (SSI) enabled the classification of plants into four groups: first—genotypes with good performance in stress and non-stress conditions, second—with good performance only in non-stress conditions, third—with good performance only in stress conditions and fourth—with weak performance in both types of conditions (Golbashy et al. 2010, Grzesiak et al. 2014b). According to Grzesiak et al. (2014a), seedlings of maize hybrids and triticale cultivars which were tolerant to soil compaction were found to be tolerant also to drought or waterlogging. According to Kono et al. (1987), Iijima et al. (1991) and Grzesiak et al. (2014b) cereal species grown under drought or waterlogging conditions can be divided into the following groups: (1) species which were susceptible to drought and most stable to waterlogging (lowland and upland rice), (2) the species which were stable to drought and waterlogging (finger millet) and (3) the species which were susceptible to waterlogging but resistant to drought (maize, sorghum). In the present paper, we show that the difference between water potential of leaf and root in seedlings subjected to different soil moisture lies in the limitation of water uptake by roots under drought or under flooding (Figs. 1, 2). In the hybrid resistant to compacted soil the differences between ψ L and ψ R were smaller than in the sensitive one. According to Tardieu (1993) and Ehlers and Goss (2003), in plants grown without watering under given evaporative demand of the air, water potential within the soil–plant–atmosphere continuum is dependent on ψ S because water uptake by roots, the content as well as the matrix potential of soil water decrease. Extraction of water from defined soil volume in an experimental pot causes the soil matrix potential to decrease steadily day by day. When ψ R and ψ L decline at noon, the tissues’ turgor is reduced. This will in turn affect the rate of cell enlargement, which may decline noticeably in periods of restricted water budget. Only in the evening after relaxation will the rates of cell enlargement and growth increase again. Growth by cell elongation can be continued throughout the night and possibly the growth at night is greater than during the day. During the course of water extraction and soil drying in the pot, the daily amplitudes of ψ L and ψ R become more pronounced. In seedlings subjected to prolonged stresses the critical value of water potential is reached and leaf wilting occurs because ψ L does not rise above the wilting point (Bengough et al. 2011; Lipiec et al. 1996; Passioura et al. 1993; Smith and Griffiths 1993). According to Jackson and Ram (2003), daily changes in leaf water status of seedlings grown under high soil compaction indicate damage to light-harvesting mechanisms in stressed plants and support the hypothesis that damage of PSII explains the prompt closing of stomata by stressed plants. The ability to maintain the structure and function of cytoplasmatic membranes under water deficit is one of the most important physiological markers and conductance measurements of membrane injury are frequently applied as a screening test for the estimation of tolerance to various stresses (Blum and Ebercon 1981; Janowiak and Markowski 1987; Palta 1990). Our results (Table 2) indicate that differences between sensitive (Ankora) and resistant (Tina) genotypes might stem from the fact that stress resistant genotypes possess more efficient mechanisms protecting membrane functions and structure. Similarly, other authors suggest that resistant plant species show stronger binding of chlorophyll molecules to the lipid-protein complex of chloroplast membranes (Smirnoff and Colombe 1988; Yu et al. 2008). Our results suggest that the reduction in plant biomass under high soil compaction is also related to chlorophyll content (SPAD) and gas exchange rate (P N, E, g S) and not only to changes in ψ L and in membrane injury (Tables 2, 3). The relation between leaf water content and gas exchange parameters was described in many papers as the basis for the estimation of photosynthesis limitation by stomatal or non-stomatal mechanisms in plants grown under stress conditions. The earliest response to leaf water deficit is stomata closure, which limits CO2 diffusion to chloroplasts (Kicheva et al. 1994, Grzesiak et al. 2013b). Non-stomatal mechanisms during water stress result in changes in chlorophyll synthesis and structural changes in chloroplasts (Medrano et al. 2002). As such, the decrease of P N can be attributed to the influence of soil compaction on soil aeration and reduction of air transmission in the root system. Similar to our results (Grzesiak et al. 2013b), Else et al. (2009) found the significant correlation between stomata conductance and decreased leaf water potential for flooded tomato plants. In the present work it was shown that both under different soil compaction treatments and their multistress influence together with drought or waterlogging, the decrease in SPAD was greater for the sensitive genotype. The obtained results are in compliance with the findings of our earlier studies as well as with studies by other authors, which often showed a decrease in chlorophyll content in leaves under stress conditions (Damanik et al. 2010; Zhao et al. 2014). However, the results do not provide clear answers confirming the relationship between chlorophyll content and the rate of photosynthesis. It was shown that both a lack and a negative or positive correlation between chlorophyll content and the rate of photosynthesis is likely caused by the fact that not all of the chlorophyll contained in the plant participates in photosynthesis and it may also perform other protective functions, with higher content often observed in plants exposed to stress. The reduction in chlorophyll content observed in plants exposed to environmental stress is caused by the inhibition of synthesis and accelerated decomposition of chlorophyll, and stress resistant species have stronger chlorophyll molecules association with lipid-protein complex membranes of chloroplasts (Poljakoff-Mayber 1981; Smirnoff and Colombe 1988). As a result of various stress factors rapid changes occur in hormone levels of plant tissues which alter the balance between synthesis, degradation and transport of hormones. Some of these changes may be adaptive responses to stressful conditions while others may be an expression of metabolic disorders. ABA, as a key stress hormone, is involved in plants’ reactions to various environmental abiotic stress factors such as drought (Yun and Feng 2014), soil compaction and flooding stress (Jackson 2002). Its main, although not yet fully recognised, role during plant growth under adverse conditions is the activation of many stress responsive genes (Christmann et al. 2004) and the involvement in root-to-shoot communication (Asch et al. 2009; Jiang and Hartung 2008) and stomata closure (Pei and Kuchitsu 2005). The vital role of ABA in maize seedlings has been shown under low temperature, drought, flooding and soil compaction stress (Hwang and Vantoai 1991; Janowiak et al. 2002; Tardieu et al. 1991). The greater increase in leaf and stem ABA content during single-stress drought (L + D) in the tolerant hybrid Tina in comparison to the sensitive Ankora confirms its universal protective role in plants against water shortage. There is no additive effect of combined stress conditions (S + D, S + W) on ABA in either of the hybrids (Fig. 3). Increased stem ABA content, especially in tolerant hybrids under single and combined stress conditions indicates a higher root-to-leaves ABA transportation rate via transpiration stream (Tardieu et al. 1991) and it might be the reason for ABA decrease in roots. Generally, stress or combined stresses affecting maize seedling roots cause ABA increase in their upper part and these changes are acclimation signals which interact with other hydraulic and chemical signals. This hormonal root-to-shoot signalling is more pronounced in stress tolerant hybrids (Tina) in comparison to sensitive ones (Ankora) and it could be one of the mechanisms involved in plant tolerance to stresses affecting roots. ABA level in conditions of water stress is increased in many species, and resistant cultivars accumulate ABA faster and in larger quantities than susceptible ones. On the other hand, there is no clear information on ABA synthesis depending on the current state of hydration and on cytoplasmic membrane damages caused by these factors (Else et al. 2009; Jackson 2002; Janowiak et al. 2002; Saniewski et al. 2003; Yun and Feng 2014). Signals from the roots to the leaves disseminate information about environmental factors acting on the root and initiate changes in adaptation, development and growth (Davies et al. 2002; Jackson and Ram 2003; Sobeih et al. 2004). The hybrid-specific changes of antioxidant activity under drought and osmotic stresses have been observed by Kellos et al. (2008) and Kolarovic et al. (2009). However, it seems that the most important factor for plant health is antioxidant activity in roots—the organ directly exposed to stresses—which is proved by significant correlations with physiological parameters of shoots. In natural environments, we frequently have to deal with the situation of simultaneous presence of different stresses and their interactions cannot be directly extrapolated from the response of plants to a single stress. Physiological markers assist the selection of plants with particular characteristics but this task is time-consuming, requiring much experience, taking into account the different phases of growth and development of plants and reproducible environmental conditions. Undoubtedly, molecular markers are more versatile because they do not become altered by environmental factors and the selection is independent of the development phase of the plant. Nevertheless, our research and studies by other authors have shown that physiological markers are satisfactory for the study of populations in terms of their sensitivity to stress and they may support molecular testing (Masle 2002; Mittler 2006; Sun et al. 2015). Due to the increasing demand for food, and at the same time, reduction in agricultural area, it is important to understand the mechanisms of plants’ tolerance to combined or simultaneous stresses. It can be assumed that due to climate change plant growth will proceed under more adverse environmental conditions and this points to the importance of research on the effectiveness of stress response mechanisms and signalling pathways activated by various stressors. Simultaneous exposure to two or more abiotic stresses causes a more harmful effect comparing to a single stress, although there are known examples where the negative effects of exposure to one factor are alleviated by the other factor. The impact of combined stresses on the physiology of crop plants is key to understanding stress susceptibility mechanisms under natural field conditions. 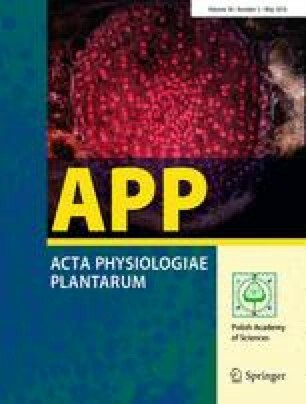 In our study we found that physiological responses of maize hybrids to abiotic stresses are associated with plant water status, which is manifested in the changes of physiological traits such as membrane permeability, chlorophyll content, leaf gas exchange parameters, ABA content and antioxidant activity. Differences between sensitive (Ankora) and resistant (Tina) maize hybrids indicate that resistant hybrids have more efficient protection mechanisms against water loss and physiological cell membrane status. Therefore, further studies on physiological and metabolic processes in sensitive and resistant genotypes are necessary, particularly in hormonal signals, sink-source relations and the supply of water and carbon. MTG, SG, FJ and GR designed and conducted physiological experiments, wrote the manuscript and prepared the figures; MTG, FJ, KK, TH, AO, PS and SG conducted experiments and wrote relevant sections of the manuscript; SG, MTG, GR, FJ, AR and TH assisted in the design of the experiments; all authors provided critical review and revision of the manuscript. Our work was funded by the National Science Centre (NCN) (Project NN 310 782540). We would like to express gratitude to SEMPOL-Holding, Trnava, Slovakia for providing the maize hybrids.